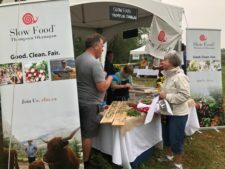 Our Slow Food communities across the Canada are identifying organizations that share our values and do work we, in Slow Food, are proud to support. By forming partnerships and taking collective action, we move towards a sustainable food future. One such organization is FarmFolk CityFolk’s, a BC provincial charity. In 2014, a partnership between Slow Food and FarmFolk CityFolk launched a campaign: “Help Send Farmers to Terra Madre”. FarmFolk CityFolk’s “working to cultivate a local, sustainable food system, providing access to & protection of foodlands; supporting local growers and producers; and engaging communities in the celebration of local food is closely aligned with Slow Food’s “Good, Clean and Fair for all”. 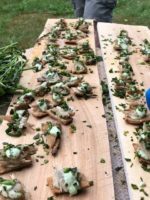 This year slow food members participated in all three of FarmFolk CityFolk’s annual fundraisers- Feast of Fields: Vancouver Island, the Okanagan and Metro Vancouver. The Feast brings together chefs, farmers, and producers in a cornucopia of delicious local food and offers our members an opportunity to outreach across BC. At the Okanagan Feast, Jon Croft talked passionately about Slow Fish while serving delicious morsels of underused delicious Canadian mackerel to a steady stream of delighted attendees. His two sons and their friend shucked oysters and Ingrid, co-chair of Slow Food in Canada, talked about Slow food Values, Slow Travel and our Adventure Canada partnership while collecting names of people interested in learning more about our work. It was a huge success. The Feast was the perfect venue to introduce our partnership with another organization that clearly shares our values: Adventure Canada. Adventure Canada, Slow Food in Canada and Slow Food USA’s are partnering on a Circumnavigation of Newfoundland cruise. 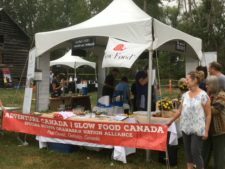 Slow Food in Canada is excited to be working on Slow Travel for Canada, hand in hand with Slow Food International and Adventure Canada. As we form relationships, forge partnerships and participate in coalitions, we share our knowledge and experience, committing together to food sovereignty. We are part of an International movement that, as Richard McCarthy (Executive Director of Slow Food USA) says, is based on “Joy and Justice”. I accept that Slow Food in Canada send me, via email, regular updates and information about its activities and events. You can withdraw your consent at any time.